Tillandsia's... or air plants, have the greatest number of species (over four hundred) and the widest range of any other bromeliad family. They are found as far north as the Mid Atlantic States, and way below Brazil. Ranging in size of one inch, to over 14 feet tall. 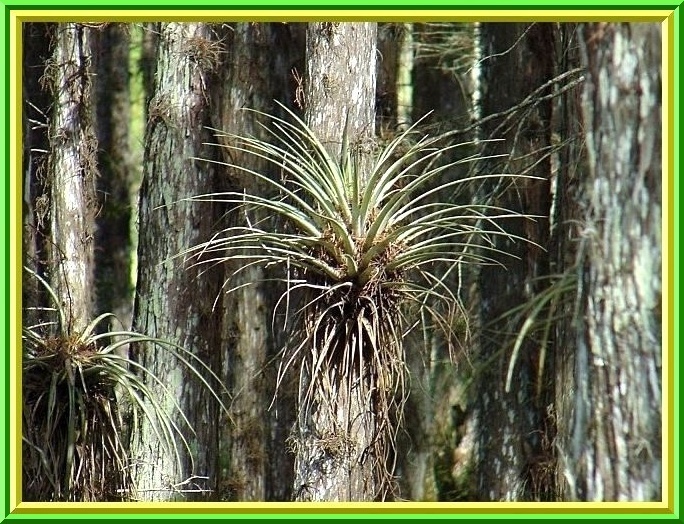 Tillandsia useneoides, (Spanish Moss or Pele's Hair) is one of the most widely recognized bromeliad (and the oldest) other than the Pineapple. This family is unique in many ways. Tillandsias require little care... but must have a lot of air movement. Many species will grow on trays without any type of potting mix. They can be mounted on wood... rocks, and a few can grow in a pot with potting mix in it. You must have a lot of patience to grow tillandsais from seed. It is not uncommon to take eight to ten years before you see a mature plant from germination to bloom. Lighting for Tillandsias should be bright but filtered light and not be in direct sunlight in the summer months... this will cause the plant to become stressed and sunburnt... however, some can do well with some winter sun in North America. Tillandsias may be grown indoors... if close to a window. Fresh moving air is advisable, but more importantly... they must have bright filtered light. The thicker or stiffer the leaves, and the more grey or white their color... the more light these plants need. These light-colored, thick or stiff leaved plants grow in full sun in their native habitats and can often tolerate full sun in humid areas... outside their native areas. 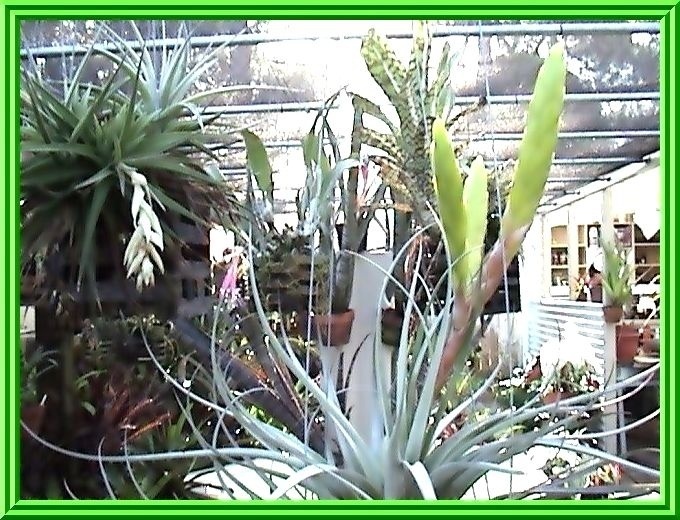 However, to be on the safe side, it is recommended that even these types of air plants be grown in bright to medium shade... between 2000 to 7000 footcandles of light is best. The green to light green tillandsias... with softer leaves are adapted to growing in shady conditions and will do best in 2000 to 4000 footcandles of light. Full spectrum artificial light... Fluorescent is best. The plants should be no futher than 36 inches from the fluorescent tubes... and can be as close as 6 inches. A four-tube, 48" fixture works best and the tubes can be any full spectrum type (Gro-Lux; Repta-Sun; Vita-Lite, etc). Lights should be set with a timer... 12 hours a day for best results. The recommended method of watering is by drenching so the plants end up thoroughly wet to the point of runoff. For indoor Tillandsias, you can do this in the kitchen sink and use a watering can or the sink-hose sprayer (if you have one), it only takes a few seconds to get the plant thorougly wet. The frequency depends on temperature... humidity... plant species... plant size and air circulation. For most outdoor and indoor situations, watering two to three times a week is sufficient. If the conditions are hot and dry... water more often. If cool and humid, less often. Tillandsias should be given enough light and air circulation to dry in no more than 4 hours after watering. If air circulation is not good, use an electric fan. 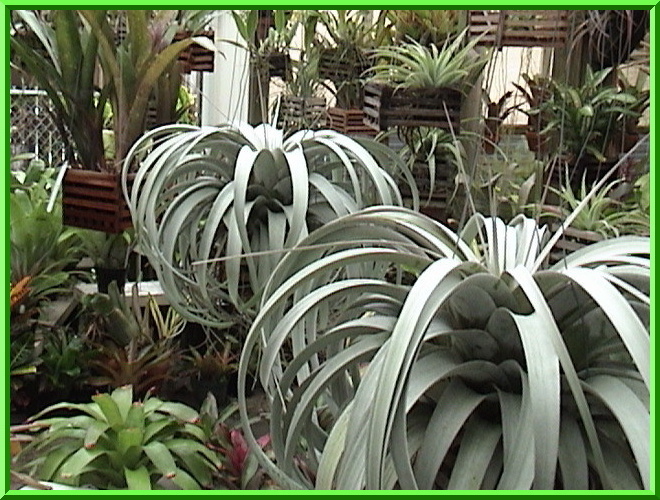 Spray misting a tillandsia is insufficient as the sole means of watering... even if done daily, but may be beneficial between waterings in dry climates to increase the humidity. To check for dryness, look at the leaf bases... in the central part of the plant. Plants may look dry, but moisture may be present in the central meristematic area. If this area stays too wet for too long... the plant may rot. An alternative watering method is soaking. Soaking is recommended if plants become severely dehydrated, indicated by limp, wrinkled, or curled leaf edges. If symtoms indicate dehydration... drenching usually won't bring the plants out of the dehydrated state so... the plants should be submerged in water for up to 12 hours. Soaking every ten days to two weeks will keep the plants happy and meet the plants needs. After watering, plants with the thick fleshy leaves that tend to trap water in their centers, should be turned upside down and shaken to remove any trapped water. Water quality is not very importany for most tillandsias, so you can use tap water, rain water or bottled drinking water. If the plants are in a shell or open pot, be sure to empty the water out... Tillandsias will not survive in standing water. The optimum temperatures for Tillandsias is 50 to 90 degrees F, but they can tolerate temperatures from freezing to above 100 degrees F. Do not expose tillandsias to freezing temperatures. 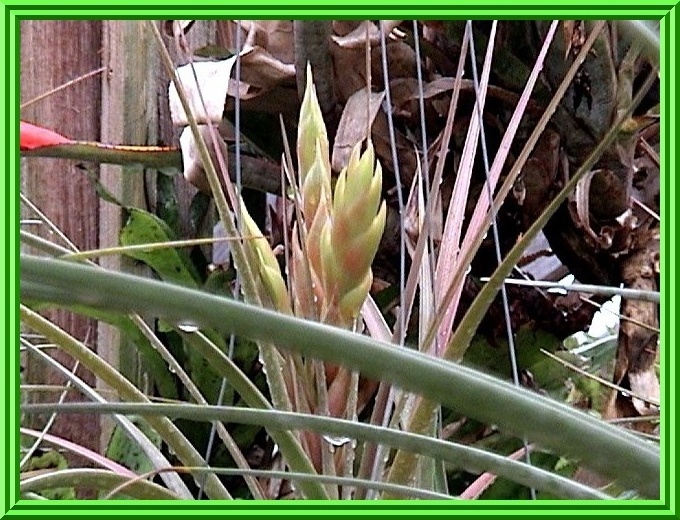 Use Bromeliad Fertilizer (17-8-22) twice a month. It is great for blooming and reproduction. Other water-soluble fertilizers can be used... but at only one quarter to one half strength (Rapid Grow; Miracle Grow; Peters, etc) if bromeliad fertilizer is not available. Do not fertilize newly received plants for at least three weeks. With their specialized coating of scales (Trichome Cells), tillandsias prove that they are adaptable epiphytes that seem to live off the atmosphere in their native habitats. 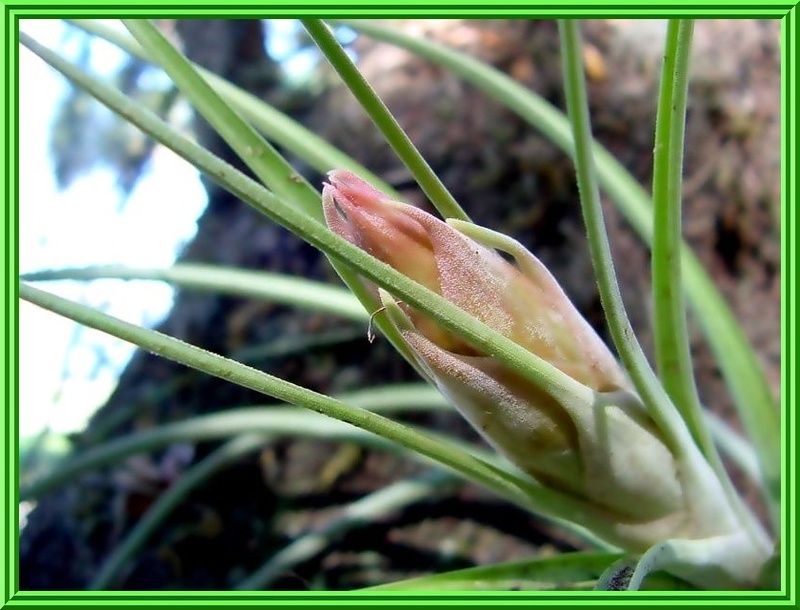 However, tillandsias must have water vapor in the air to be able to survive and grow well. People who grow them indoors always have the problem of not being able to provide them with enough humidity (air conditioning and forced heating). To increase humidity levels for tillandsias in the home, without purchasing expensive humidifers... get yourself some of those round plastic plant saucers. Use the smaller ones for your window sills and the larger ones for tabletops and larger areas. I like to use marble chips instead of pebbles... less absorption, but the pebbles will work. Fill the saucers with the chips to about three quarters full, then cover the saucer with some fiberglass screen so that it fits the top rim of the saucer. The fiberglass screening is very easy to cut to fit... just make it a little larger that the rim of the saucer, then fold it down over the edge and tie it in place with some fishing line. Then just add water and set the plants on top, or over the saucer. This provides some good humidity for tillandsias, but... nowhere near the humidity levels in the wild. To compensate for this, soak them in fertilized water every two weeks. Make sure that fertilizer solution is only half-strength... too much will do more harm than if the plant was too dry.